Girl's turning 7 tomorrow and we thought we could give her an early birthday treat. We got A1 rinkside front row seats about a month ago when the tickets first became available, thanks to great pointers from a senior at my alma mater who now owns and runs the company that promotes this annual event. We had an entertaining evening on opening night last Friday at Shah Alam Malawati Stadium. It was a special, hectic day. We packed our bags for an overnight stay at The House with The Grandparents, loaded the suitcase into the car boot and picked Girl up from The Big School on the dot. A quick shower, an early dinner and we were off to the local stadium just 5 minutes away from The House. We were glad to be super early because we got choice parking lot with an easy exit straight home after the show. The skating rink and entire performance were in our faces, literally. So was the snack cart before show and during intermission. Bean managed to high-5 Cinderella after the performance too. They especially loved all the episodes with great costumes and support cast/character movement: Lion King, Little Mermaid and Finding Dory. The merchandise were predictably expensive, just like Disneyland itself! 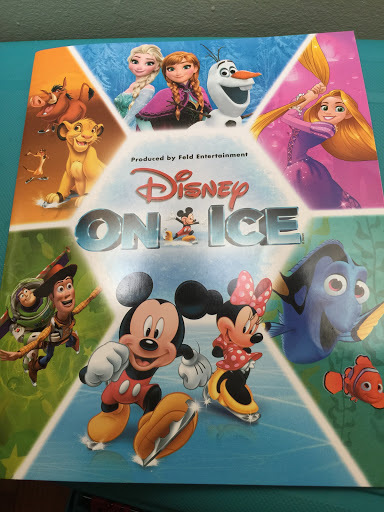 The Programme cost us RM20 per copy, an Elsa and Olaf snow cone RM50 each (came with a set of reusable cup and straw). The popcorn was RM30 per packet in custom design cereal box which The Grandparents recycled before we could take photos of the most costly empty carton. We look forward to more of such uplifting productions in future. BRAVO!! To all spectators who littered the stadium grounds and carpark/wet the public toilets: BOO YOU!